I absolutely love the embroidery ideas for towels that I see over on Urban Threads! I have admired their designs since I acquired my first embroidery machine. The difference is now I have an embroidery machine that easily stitches them out without making mistakes! 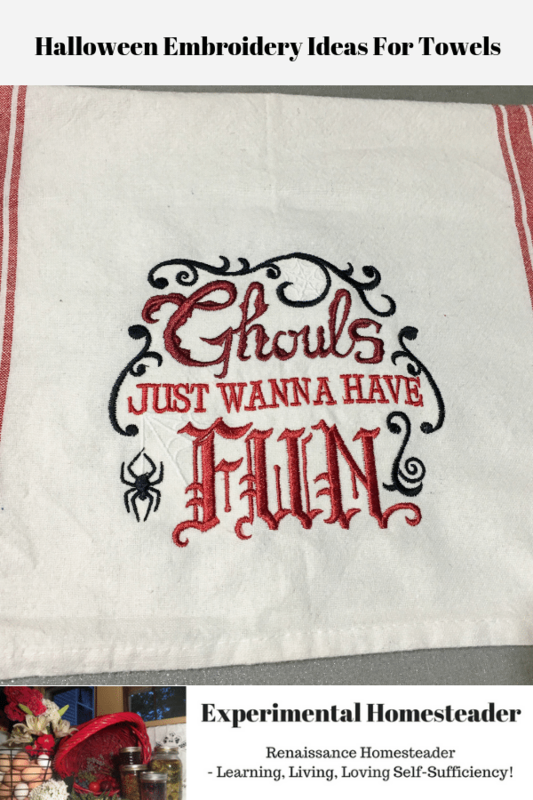 For those who want to follow my design and stitch out the spider webs in a glow-in-the dark thread, I suggest you practice on a scrap piece of fabric before you try to do it on the towel. The reason for this is you need to understand how the design stitches out and when to manually stop the embroidery machine to change the thread to black – or whatever color you choose. I also highly recommend using six layers of stabilizer under the towel. The stitch & ditch does not actually attach to the fabric. The hoop holds it in place. The reason I recommend so much stabilizer is because that is what I was taught to do in order to keep my stitching from pulling out on thinner fabrics – and it works. The very first embroidered towels I made have stitching that is still secure – five years later – and believe me, I use these towels on a regular basis. 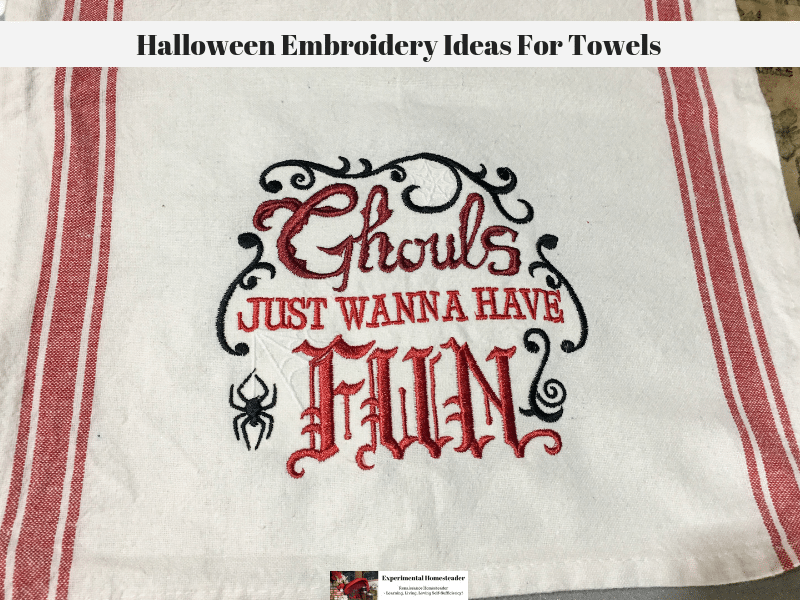 Here is how I created this particular embroidered Halloween towel. Wash and dry the flour sack towel before you begin this project. Iron the flour sack towel. Choose the proper size embroidery hoop. I used a 6″ x 10″ hoop. Cut six layers of the stitch & ditch stabilizer. Lay these on top of the bottom part of the embroidery hoop. Lay the portion of the towel you wish to embroidery on top of the stabilizer. Now secure the top part of the hoop to the bottom part of the hoop. Once the embroidery hoop is securely holding the stabilizer the towel, go ahead and attach it to your embroidery machine. Set up your embroidery machine, bring the design up so it is ready to stitch and gather all of the thread needed for this project. The design – on my machine started with the spider webs. They are meant to be black. I chose to use a glow-in-the-dark thread for them. I let the machine stitch both of them out and paid close attention. Once I knew the spider webs were stitched I manually stopped the embroidery machine and removed the glow-in-the-dark thread. I replaced it with the black thread. My machine did stop in between all the other color changes which made switching out the thread colors so much easier. When the stitching is complete, remove the embroidery hoop from your embroidery machine and shut it off. Now there is going to be some thread trimming that needs done and the excess stabilizer will need to be removed. 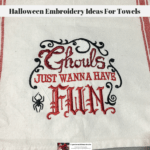 Now your Halloween embroidered flour sack towel is ready for use. Note: This design took approximately 80 minutes to stitch on the Brother ULT2001. I love how this turned out – and so did my daughters. I made one in green for one of my daughters, but to be truthful, the red looks so much more like Halloween. Of course, feel free to swap out the thread colors and customize the design to fit your preferences. These towels make great gifts and in my experience are long lasting.